I saw this via the The Beauty Gypsy and thought this was really cool and wanted to share it with you..
1 & 2: Digestive System — Eat less processed or junk food, reduce the amount of fat in your diet, step up water intake and opt for cooling things like cucumbers. 3: Liver — Cut out the alcohol, greasy food and dairy. This is the zone where food allergies also show up first, so take a look at your ingredients. Besides all this, do 30 minutes of light exercise every day and get adequate sleep so your liver can rest. 4 & 5: Kidneys — Anything around the eyes (including dark circles) point to dehydration. Drink up! 6: Heart — Check your blood pressure (mine was slightly high) and Vitamin B levels. Decrease the intake of spicy or pungent food, cut down on meat and get more fresh air. Besides this, look into ways to lower cholesterol, like replacing “bad fats” with “good fats” such as Omegas 3 and 6 found in nuts, avocados, fish and flax seed. Also, since this area is chock-full of dilated pores, check that your makeup is not past its expiry date or is skin-clogging. 7 & 8: Kidneys — Again, drink up! And cut down on aerated drinks, coffee and alcohol as these will cause further dehydration. Zone 9 & 10: Respiratory system — Do you smoke? Have allergies? This is your problem area for both. If neither of these is the issue, don’t let your body overheat, eat more cooling foods, cut down on sugar and get more fresh air. Also keep the body more alkaline by avoiding foods that make the body acidic (meat, dairy, alcohol, caffeine, sugar) and adding more alkalizing foods like green veggies and wheatgrass juice. Another thing that most of forget – dirty cell phones and pillow cases are two of the top acne culprits and this area is what they affect the most! Zone 11 & 12: Hormones — This is the signature zone for stress and hormonal changes. And while both are sometimes unavoidable, you can decrease their effect by getting adequate sleep, drinking enough water, eating leafy veggies and keeping skin scrupulously clean. Another interesting point: breakouts in this area indicate when you are ovulating (and on which side). Zone 13: Stomach — Step up the fibre intake, reduce the toxin overload and drink herbal teas to help with digestion. 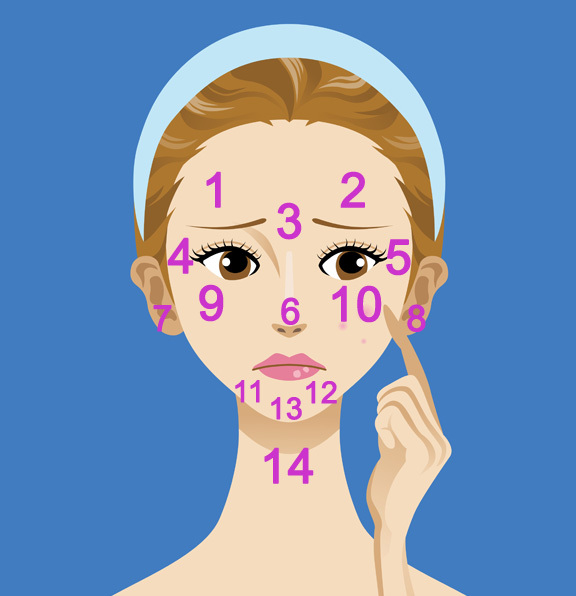 Zone 14: Illness — Zits here can be a sign that your body is fighting bacteria to avoid illness. Give it a break, take a yoga class, take a nap, take time to breathe deeply, drink plenty of water and know that everything always works out! When I do break-out I'm a Zone 6 - 9&10 - 11&12 - 13. So remember drinking water is not just the only solution to clearer skin!! I always get spots at 12 & 3 loool I goes the KFC, Twix, Skittles, Snickers bars and alcohol need to start taking a back seat.